Forget about ringing through an order to your local Indian takeaway! 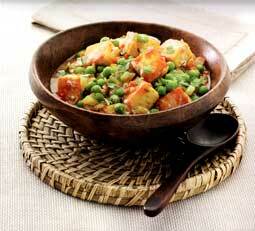 Pop in the CD of Indian music and get cooking for yourself . . . you owe it to your friends and family. Yes, Easy Indian Cooking comes with its own CD of Indian music to get you into the right mood or to play as background music when you serve up your very own Indian meal. 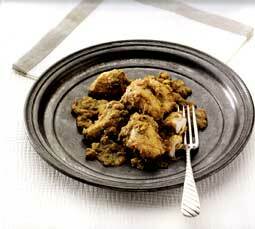 There are not many of us who do not enjoy Indian food but who cooks their own Indian dishes? Most of us shy away either because we do not know where to start or because we think it is going to be too complicated and time consuming. 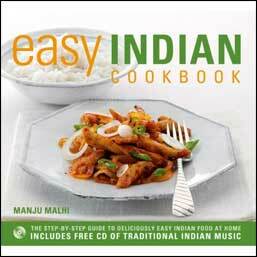 I have to tell you that with Manju Malhi's latest book Easy Indian Cooking nothing could be easier. As soon as you see the book you will realise that it has been put together for those who want to cook rather than just another pretty book for the kitchen shelves! It has been ring bound which means it opens flat onto your work surface . . . no more struggling with one hand on the book, trying to prevent the page turning, whilst trying to multi-task with the other! The main section as you would expect is the recipes and each recipe takes up two pages. Open up any recipe and one page will be a photograph of the finished dish and how it should look when you serve it - something I find invaluable, especially when it comes to giving me confidence that I am doing things right! You don't have to know your Mirch Wali Murgh from your Machchi Amritsari - that's Chilli Chicken and Deep-Fried Fish to you or me - because each recipe has its English name as well as Indian name. Recipes are clearly laid out with information on servings, preparation time, cooking time and a brief summary of what it is. Ingredients, for which there are no long or complicated lists, and instructions are clearly written in separate columns. Ensuring you have all the information you need to cook easy Indian meals everything can be found in this one book. Divided into three main sections - The Basics, The Recipes and The Menus - you can't go wrong. Even a beginner can feel confident in producing delicious dishes. Manju says in the opening paragraph of The Basics section, "Food without spices is like summer without sunshine - and this is very much the ethos of Indian cooking, First-time cooks often find the number of spices and ingredients used in Indian cuisine to be quite daunting - but the simple truth is that preparing an Indian meal is very straightforward. Mastering just a few basic techniques and becoming familiar with some of the essential ingredients will strip away the mystery and make preparing Indian food less time-consuming, much more satisfying and incredibly rewarding." That really sums up what the book will give you - something that is very "satisfying and incredibly rewarding." Highly recommended that you don't miss adding this to your kitchen library.